We are approaching the 500th anniversary of the Reformation by intentionally highlighting our ecumenical relations with a number of Christian traditions and what we have achieved together. This anniversary will be approached in a spirit of ecumenical accountability. Therefore, we are making sure that you have every opportunity to reflect in your own context on the fact that Lutherans are ecumenical, and that we dialogue with our sisters and brothers in other traditions in response to Jesus’ call that we may all be one, so that we can work together to heal our broken world. From Conflict to Communion, the report of the Lutheran-Roman Catholic Commission on Unity, released in 2013, marks the first attempt by the two traditions to jointly trace the Reformation history. It will help start ecumenical discussions around the beginnings of the Reformation in local settings. We also encourage you to make use out of the joint Lutheran-Roman Catholic liturgy that will be released in the second half of 2015, also strongly linked to From Conflict to Communion. 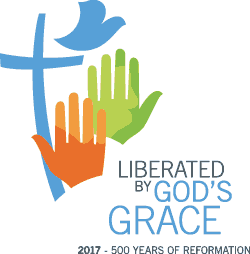 Anglican-Lutheran study materials for congregations that focus on the theme “Liberated by God’s grace” will be published in 2016. The Lutheran–Roman Catholic Commission on Unity invites all Christians to study its report open-mindedly and critically, and to walk along the path towards the full, visible unity of the Church. In 2017, Catholics and Lutherans will jointly look back on the event of the Reformation and reflect on 50 years of official worldwide ecumenical dialogue during which time the communion they share anew has continued to grow.